Several weeks ago we caucused to discuss stripes and their virtues. The topic was so vast and complex that I could only cover horizontal stripes in that initial post. Now we praise vertical stripes. Stripes, you are so wonderful! They say that vertical stripes are thinning, or lengthening, or elongating, but I don’t really think that’s true. They are, however, more thinning than horizontal stripes. And they are very cheerful. For those of you who’d like to break up the solids in your outfits (we can’t color-block all day, every day), but don’t see yourself in florals, stripes are an excellent choice; they can read modern or traditional depending on the color palette and pattern. 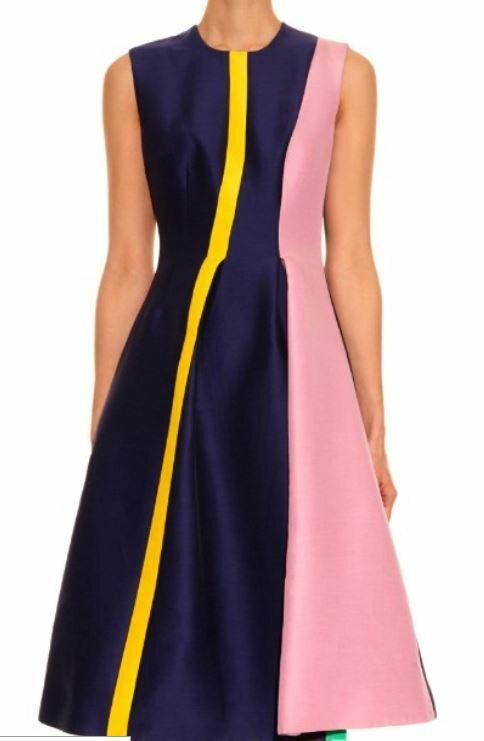 From a verbal description, this dress might sound overwhelming: there are four colors — including contrasting colors (blue and orange) — in this pattern, and the stripes vary in width. But I think the overall effect is bright and lively without being overly busy. I have, however, elected to tone things down with camel colored accessories. This is a rare instance of my shoes [almost] matching my bag; the shoes are patent leather and the bag is polished calfskin. 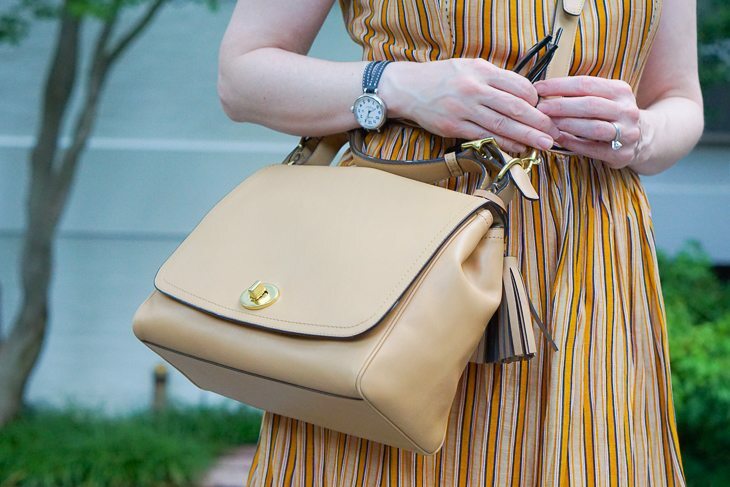 My dress is old, but I poked around and found a few striped garments from the current season that I think are very charming. A special bonus: Irregularly striped party dress! As fun as high contrast, colorful stripes are, the vertical stripes that I love most, and that I encourage you to incorporate into your work wardrobe, are pinstripes. 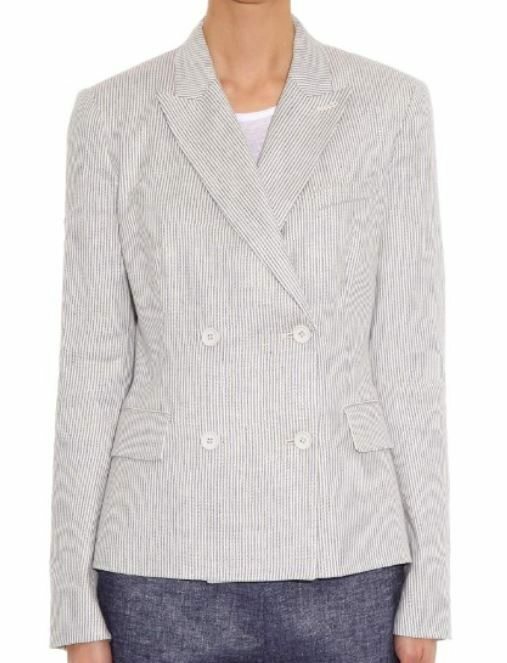 A pair of pinstriped pants add a little visual interest to any jacket-and-pants combination. 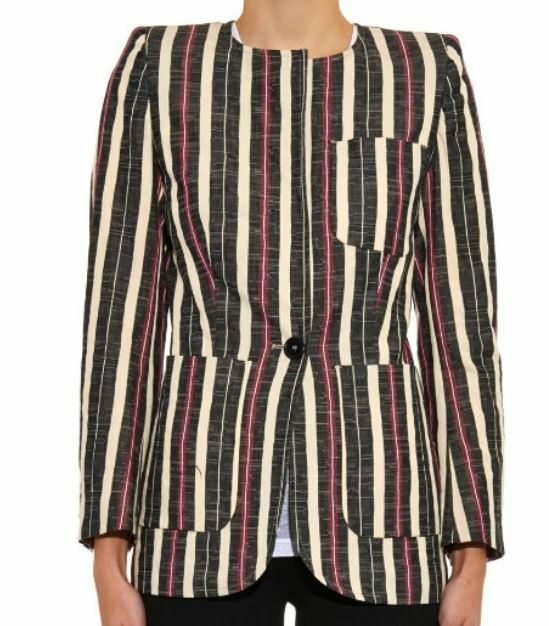 Pinstriped suits also look beautiful with patterned blouses and jerseys. If you are looking for a classic combination, the London banker pinstriped suit with striped shirt combination is very sharp. 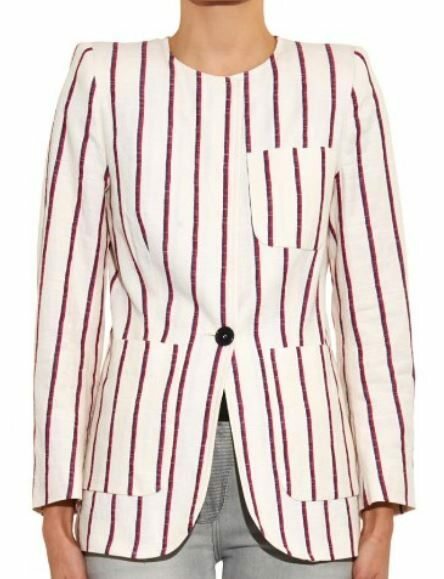 Check out these earlier posts for more pinstripes: Warm as Toast (pinstriped pants), Nervy Optical Stripes (pinstriped top), Adding Definition with Color (pinstriped jacket). I know what you mean about pinstriped pants. 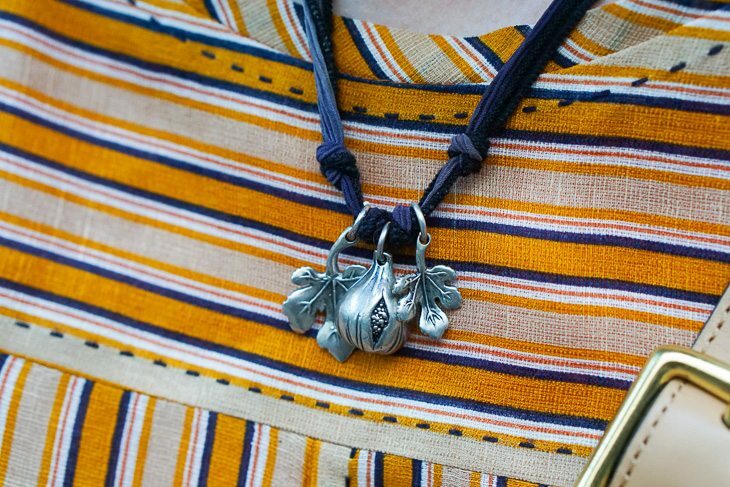 They are a neutral, and look good with other patterns. I only have one “suit”, a navy pinstripe, and it looks good with striped or paisley blouses and also with patterned silk scarves. As a matter of fact, it looks dull and pedestrian with a solid blouse or top! My aesthetic is strongly influenced by menswear, but I like to give it a feminine twist. Pretty scarf, ruffles,( in moderation) always jewelry, lace edged pocket squares, etc. Love the dress! 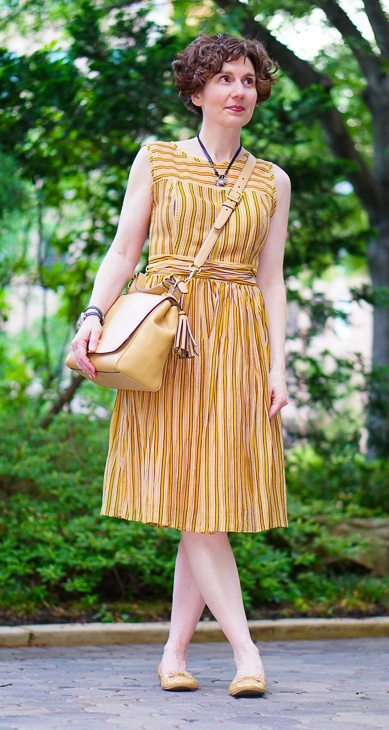 I’ve been looking for a vertical stripe dress summer dress but have come up empty-handed this season, though I did find a lovely diagonal stripe skirt that’s been wonderful. Stripes are my favorite pattern by far. A favorite pair of summer pants is white cotton with very narrow blue and some shade of purple stripes. I dread the day they die, because finding the perfect stripe is a matter of serendipity for me. I think the great thing about stripes is that creative placement/angling of pattern pieces can create a lot of visual interest, even in a garment with a very simple cut. 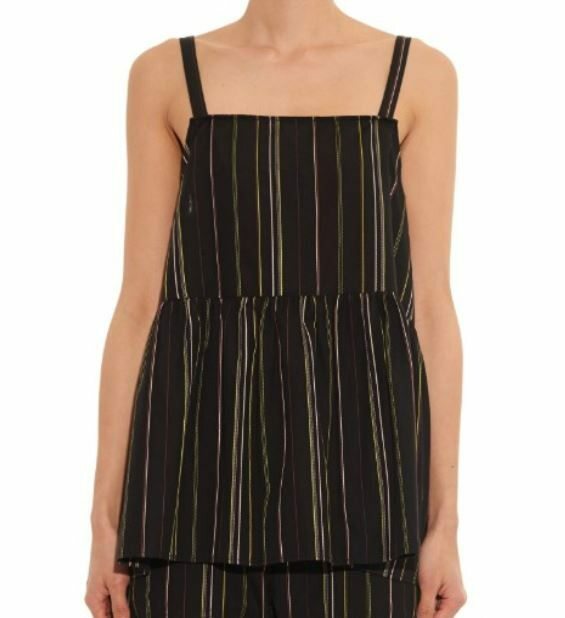 The J Crew dress you link to is a nice example of that, but your dress is even better: vertical stripes on the bodice and skirt, horizontal stripes on the yoke and waistband, diagonal stripes on the bias neck binding. Oh, and the embroidered running stitch too — it’s like a meta-stripe! I love it!